The Venetian School, which added the last great element—color—to Italian art, continued the impulse of the High Renaissance longer than did the other schools. Decadence set in less rapidly with them, and the last really great masters were Venetians. The art motive of Correggio was also that of the Venetians. With them it was truly art for art’s sake in the highest meaning of the word. Although a sensuous art, it was noble, stately and dignified. Nature to the Venetians rang with symphonic harmonies, and although the grandeur of line of the Florentines was not theirs, they built up vast and grand color harmonies that hold one with the power of a mighty orchestra. It is the Venetian love of the sensuous, of the beauties of nature that made landscape so prominent a feature of their painting, and they carried landscape to a greater height than ever before in Italian art. There was no particular idealization about the Venetian painters, they took nature around them as it was; but how they succeed in endowing it with absorbing interest and beauty! It is the grand, the noble and the dignified of our world as it is that they portray with con- summate skill. Qlorgione (14777-1511) was a painter whose influence over his contemporaries and followers was greater than that of any other Venetian. There are very few authentic pictures by him, but even without them his influence would have made his name great in art. 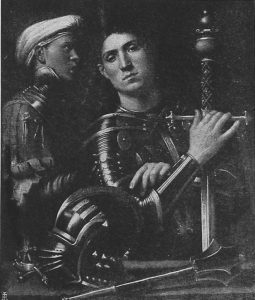 He was a fellow pupil with Titian under Giovanni Bellini, but Giorgione shaped Titian’s art more than did Bellini himself. A noble, serious sentiment and rich, glowing, intense color distinguish Giorgione’s work. He was the first Italian to select subjects of the every day world about him. Up to his time subjects had been rather removed from ordinary life—Madonnas, Saints, etc. ; but Giorgione took the every day, the common, and made it dignified and noble. Giorgione treated nature in its broad, simple masses, and always sacrificed detail to such mass and general effect. In landscape he went far beyond his master, Bellini, and he always succeeds in imparting the mood of the scene represented into the landscape background. His com- positions are very simple; few figures, usually two or three, suffice for him, but with these simple means he succeeds in imparting his moods and feelings and creating works that are of strong and enduring interest. Giorgione created a class of subjects in painting that have been likened to lyrics and pastorals in poetry. There is a picture in the Louvre, the so-called Concert Champêtre, which, although denied by some to Giorgione, serves as a good example of these subjects. There is a full sensuous quality in this picture, noble,Giorgione created a class of subjects in painting that have been likened to lyrics and pastorals in poetry. There is a picture in the Louvre, the so-called Concert Champêtre, which, although denied by some to Giorgione, serves as a good example of these subjects. There is a full sensuous quality in this picture, noble,grand masses of trees, long vistas of landscape, in the foreground beautiful forms that are rounded and modeled with softness and glow of flesh, soft, transparent shadows and enveloping atmosphere; but it is a grand, noble mood of nature, a lofty feeling expressed through the mere sensuous. Giorgione painted historical subjects, mostly in fresco; but they are nearly all ruined, most of them having been painted on the outside of buildings. In portraiture Giorgione issimply magnificent. With all their lifelike quality, with all their closeness to nature, which makes one feel that they are pictures of actualities, of people who have really existed, there is a nobility in these portraits, a high ideal quality, thatplaces them far above the common. Through them all we feel, besides these qualities, por Giorgione’s personality, his temperament. The portrait of General Gattamelata, for instance. What a powerfully living quality in it, what strength of modeling, what close rendering of textures, and what careful following of the values of the sheen on the armor! But also what nobility of spirit it breathes how powerfully it holds our attention and interests us! Sometimes Giorgione would make ideal compositions out of portraits, and a favorite subject of this kind would be a Concert. The Concert, in the Pitti Gallery, Florence, is perhaps the finest of this sort of pictures. There is the same quality of living reality, the same fineness of modeling, the same seriousness of mood. Here we see a cscroi rendering of textures, too, than had ever before been known in Italian art. The impression left on one by Giorgione’s pictures is very strong. One feels that one has been before something real, something of life and blood; but it is a grand, noble reality.